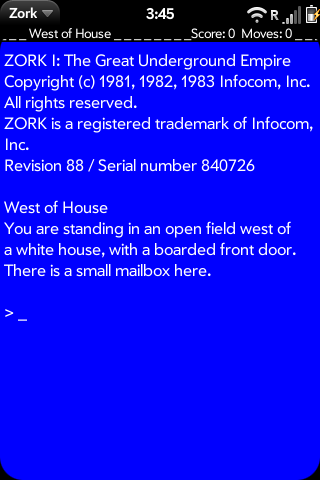 ZORK I is the grand daddy of all text adventure games, and it's been ported to the palm pre! full version, you can gain the 350 points available in the original. Autoscroll the game window after receiving new input, right now you have to manually push the screen up in order to see anything that goes beyond the bottom of the screen. The project is closed source for now, once the engine is fully finished I will open it up.